The placenta is the lifeline of your baby. Did you know that you grow a new placenta every time you get pregnant? This amazing organ is the lifeline of your baby - it connects you to your growing baby - literally! The placenta connects your baby to the inside of your uterine wall via the umbilical cord. The umbilical cord is made up of two veins and one artery. 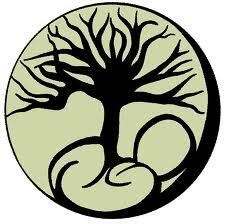 By the end of your pregnancy your placenta is a 1-2 pound, 9-inch circular organ full of nutrient-rich blood. The placenta produces hormones necessary for a healthy pregnancy, facilitates nutrient and antibody uptake, supplies oxygen exchange via the mother’s blood supply, and eliminates waste. Essentially, your placenta acts like your baby's organs until her organs are mature enough to function on their own. While the vast majority of women will never need to know anything more about their placentas than what I've already written, a very small percentage of women will either have or know someone who has complications. To facilitate your ability to make an informed decision, recognize warning signs, or understand what your friends or doctors are talking about, let's briefly describe the two most common placental conditions. Your placenta normally grows on the upper third of your uterus. In very rare cases (less than 1%) the placenta implants itself on the lower part of the uterus, near or on top of the opening of the uterus- the cervix. 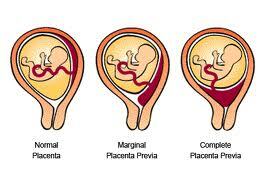 This is called placenta previa. Sometimes, early in the pregnancy, you might have an ultrasound and be told that you have a low lying placenta. Most often, the place where the placenta is attached to the uterus will raise and move away from the cervix as the uterus grows. At the end of the pregnancy, if your placenta is still partially or fully over the cervix, you will almost certainly have a cesarean. The most common symptom of placenta previa is painless vaginal bleeding. As with any bleeding during your pregnancy, call your doctor immediately. Another very rare condition is placental abruption (less than 1%) in which the placenta either partially or fully separates from the uterine wall during pregnancy or labor. This condition can cause serious blood loss in the mother and deprive the baby of adequate oxygen. You are at higher risk if you have had previous cesareans, smoke or have very high blood pressure. If the abruption is minor, bed rest and close observation may be sufficient. If it is severe, you will likely need to deliver via cesarean. The most common symptoms of placenta abruption are vaginal bleeding, continuous severe abdominal pain, lower back pain, tender abdomen, and constant tightening of the uterus. It is important to note that there may not be vaginal bleeding if the abruption occurs above the baby, so it is important to pay attention to all symptoms and listen to your intuition. For almost all women, neither of the above conditions will apply, and the placenta will eventually be expelled from your body naturally soon after the birth of your baby. Placental expulsion, where the placenta separates from the wall of the uterus and is expelled from the body, is called the third stage of labor. Your care provider will likely give you an intramuscular shot of pitocin (synthetic form of oxcytocin) and provide traction for your cord to gently assist the expulsion of your placenta. This is called active management of the third stage. A Cochrane database study and the WHO suggest that blood loss and anemia are reduced in women offered active management of the third stage of labor, as long as they delay cord clamping to prevent anemia in the baby. Most female mammals eat their placenta immediately after giving birth. The animals do it partly to replenish vital nutrients after a major loss of blood and also to keep predators from getting too excited by the afterbirth. However, a growing trend of Americans and Europeans advocate for placentophagia (eating the placenta). They claim that eating the placenta will replace a mother's nutrients lost during the pregnancy and birth, prevent postpartum depression, and promote generous breast milk production. There have been no studies conducted to verify this claim. However, we do know that the placenta is rich in iron and vitamins- and we also know that anemia and malnutrition have been shown to increase your risk of postpartum depression. We also know that the placenta is rich with hormones that facilitate involution (the contracting of the uterus down to its normal size) and increase milk production. For those who are at risk for postpartum depression or anemia, eating your placenta might be just what the doctor ordered! Specialists, including those who practice Chinese medicine, dry the placenta, grind it to a powder, and then encapsulate it. 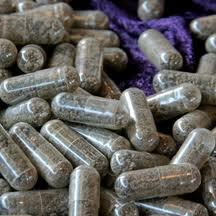 A friend of mine who recently delivered twins by cesareans in a hospital here in Colorado had her placenta encapsulated. She said she was a hormonal train wreck after the birth, but started feeling better immediately after she began taking the capsules a day or two later. Just anecdotal and possibly a coincidence of timing, but she felt they really helped her. Very well written! If I ll ever get pregnant I want to have you by my side! @Gina: Thank you for sharing. I've never done it personally...but I would definitely recommend it for anyone who has struggled with postpartum depression. Great story. I am Mrs. VANISSA DANIEL from USA, i want to share a testimony of my life to every one. i was married to my husband, and i love him so much we have been married for 4 years now with three kids. when he went for a vacation to RUSSIAN he meant a lady called SANDRA, he told me that he is no longer interested in the marriage any more. i was so confuse and seeking for help, i don't know what to do until I met my friend miss joy and told her about my problem. she told me not to worry about it that she had a similar problem before and introduce me to a man called prophet jeremiah omoto who is man of God for her ex and bring him back to her after 2days. Miss joy ask me to contact prophet jeremiah omoto I contacted him to help me bring back my husband and he ask me not to worry about it that the God of his fore-fathers will fight for me. He told me by two days he will re-unite me and my husband together. After two day my husband called and told me he is coming back to sought out things with me, I was surprise when I saw him and he started crying for forgiveness. Right now I am the happiest woman on earth for what this great MAN OF God did for me and my husband, you can contact prophet jeremiah omoto on any problem in this world, he is very nice, here is his EMAIL contact: prophetmercyland@gmail.com or watch him television marcylandtv com or +2347055176615 . Planning for a baby is important if any couple wants to get pregnant. It should be a reliable one. But there are some authentic online services who are providing those and they are really good at it.